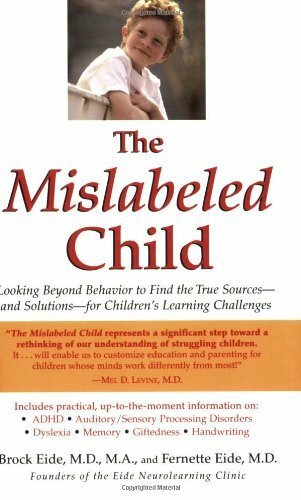 The most helpful basic book I've read so far about all kinds of learning differences is The Mislabeled Child. If I could only read only one book about learning differences this would be it. The book to helps the reader understand both the experience of a child with a learning difference, and what we might see as educators. In a section called, Problems Seeing Words, the authors list the specific problems a child may be having actually seeing the words. A sensation that the words and letters on the page seem to wobble, mingle, move over each other, or even pop in and out of the page. Fluctuating double vision, especially when trying to focus on the middle letters in a word. A tendency to omit suffixes at the ends of words or to omit internal fragments of words. Sometimes these omissions can produce important changes in meaning, as when one young gentleman strained our composure by repeatedly omitting the letters -ni- from the word organisms while reading in very earnest tones an otherwise dry passage on marine biology! This list goes on, including sensitivity to the glare from shiny paper - a sensitivity my students often show in response to sheet music printed on glossy paper. "Can we turn off the music light?" Mary might say. "It's just too bright." Here are a five tips for all teachers when teaching children who may have learning differences like dyslexia. Educate yourself. There is a wealth of information available on all kinds of specific challenges students face. (There's a suggested reading list at the end of this post.) You owe it to them and to yourself to read and study. You'll become a better and less-frustrated teacher. Frustration is something these children have plenty of already, so they don't need their teacher to be confused or flummoxed. Start with the experience of the music, not the notation that describes it. It's not cheating to play a piece or a phrase for a student. It's not depriving them of anything except frustration. Show them the snazzy rhythm - don't ask them to decode it first. Teach them the fun of playing something before you tackle any kind of reading. Give them a successful experience and then show them what it looks like on the page. Asking routine questions like, "What's the key signature, time signature, first note" etc. will only bring you lots of grief as they scramble through their unreliable memories for the difference between all these confusing terms. Be cautious when assigning written work. Many students with learning differences also have dysgraphia - difficulty writing and forming letters. Written work involving writing the very letters they most often confuse and combining it with writing on (usually too small) music staffs is often overwhelming. Use manipulatives. Yes, I'm back to things like animal erasers. But seriously, is there an easier way to put the fun back into simple theory questions and keyboard geography than to use brightly-colored animals? Imagine you're a student for a moment. Would you rather be told, "Jamie, you need to lower the third note of the triad," or "Jamie, I think the penguin needs to hop down a key." Ask questions. If a student answers correctly, go further. "How did you get that answer?" I was shocked a few years ago when one of my students told me, "I knew because of the way you asked the question. You always say the right answer first - like is this a B or a C?" Hmm...file away that information immediately as one of my more useless teaching un-skills. All students have strengths and weaknesses. The skills I've assembled from teaching some of my most challenging students has made me a much better teacher for all my students. You can do the same thing. Just start reading and keep your eyes and ears open at every lesson. Thinking Persons's Guide to Autism While not specifically about learning differences, this book is full of useful information about all different kinds of brains and how they work. The Yale Center for Dyslexia & Creativity - a huge website with information, articles and references on all aspects of dyslexia including sections for parents, educators and those with dyslexia. Read more about my experience teaching students with dyslexia in My Imaginary Standard.